One of my biggest pet peeves FOREVER and EVER has always been when people complain about “not having enough time” to do something. I realize some people are busier than others, some people work faster than others, some people have more energy than others, and some people are more efficient with their time — but we ALL have 24 hours and (for the most part) we have some choice as to how we spend those hours. I don’t have time to clean / organize / put away / fold / hang / etc. I don’t have time to meal plan / cook / bake / freezer cook / etc. I’m sure you’ve all heard (or said) something similar over the course of your life — I’ve even let these statements slip out of my mouth! However, I truly believe if something is important enough to us, we will do everything in our power to MAKE the time for that activity, event, person, task, etc. If it’s not important enough, we won’t make the time. PERIOD! 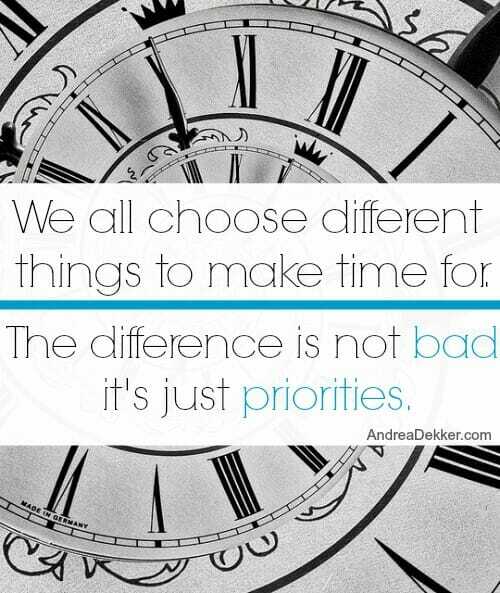 We CHOOSE what we will or will not make time for (sometimes subconsciously, but it’s almost always a choice). One thing that hasn’t been very important to me over the years is reading for my own personal enjoyment. I’ve never been a big reader, I don’t particularly enjoy reading, and it’s not all that important to me at this point in my life. So, even though I read boatloads of books to my children and we visit our local library at least once a week, I’ve never made any effort to read books for my own enjoyment — not because I don’t HAVE the time, but because I have chosen to spend my time in other ways. However, based on a bunch of time-management related emails I got in early September, I decided to challenge myself to integrate reading into my regular daily routine — and to see how many books I could read in 6 weeks. I figured I would “practice what I preach” and find a way to fit a decent amount of reading into my relatively full schedule… and you know what? I think I even surprised myself by how easy it was to shift a few priorities around to MAKE more time to read. Before my self-inflicted reading challenge, I can only think of 4 or 5 books I read for myself since Dave and I got married (TEN YEARS AGO)! So imagine my surprise when I managed to plow through 9 full-length books in less than 6 weeks!! And that’s on top of all the books I read to my kids! I truly don’t feel like I “gave up” much to make time for reading each day — and I actually ended up enjoying almost all the books I read! 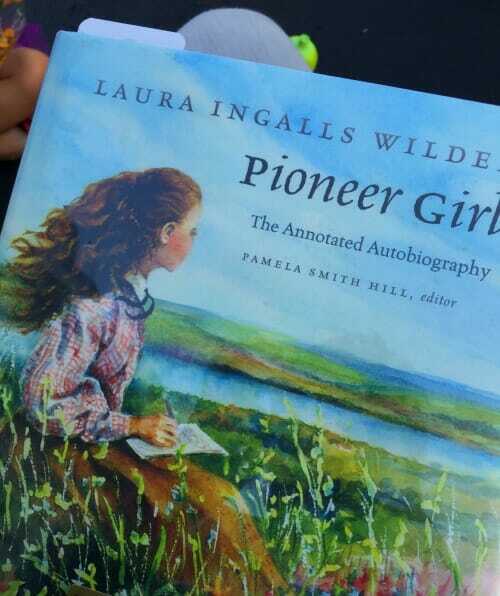 I have a weird obsession with the Little House books and with Laura Ingalls Wilder. I think I secretly wish I could have grown up “out on the prairie” although I know it really wasn’t as fabulous as the books make it out to be. Anyway, I didn’t read all the “extras”, but it sure was interesting for me to read more about Laura, not just her stories. Dave and I both read this book when we were dating, but it was fun to re-read it now that we’ve been married for 10 years… and yes, my top love language is still very much “acts of service”. Also, the Kindle version of this book is currently free! This book was recommended by a lady from church, and it was SO good. The beginning felt a bit like a romance novel to me — something I’m not into at all, but overall I really really liked this book. It’s obviously fiction — but the author did an extensive amount of research in attempts to make the storyline and details of the book fit with different speculations about the life of Eve. Such a fun, light-hearted read! I literally laughed out-loud many times while reading this book. Dave would mock me — but then when I reread things to him, he even laughed. I was really excited to read this book, but I struggled to stick with it. I had to force myself to keep reading — I guess I just didn’t like the diary format. The only reason I decided to read this book is because I could get it free on my Kindle App. The storyline started slow for me… but by the 3rd or 4th chapter, I was totally hooked. I actually stayed up late and woke up early just to keep reading more and more and more! As of right now, the book is still free for Kindle! Dave had this book saved to our Kindle account from something he read a year or so ago. I skimmed through it because I’m in a Bible Study on Genesis right now. It was interesting, but not the type of book I’d just sit down and read straight through. I checked this book out from our local library and read it off and on while I was reading other books. It was good, but a little boring in my opinion. I’ve been wanting to read this book for a while now and I snagged it for just $0.99 on Amazon a couple weeks ago. It was a really quick read — and so full of good ideas! I actually thought this book was going to be about time management — but ironically, it’s about making more time for yourself and things you enjoy. So how did I make the time? I’m sure there are many little things I did to to make more time for reading — but as I thought about what I did, 4 distinct things came to mind. I think these 4 tips made the biggest difference in my ability to carve out more time to read. 1. I made it convenient to read. I always carried a book (or my phone) with me so I never had an excuse not to read. I read while Dave drove, I read while I made dinner and the kids were playing with Dave, I read on my phone while I was up in the middle of the night rocking a stuffy-nosed James, I read outside while the kids rode bikes up and down the driveway, I read on my phone when I waited in my car to pick Nora up from school. If it wasn’t convenient, I wouldn’t do it… but since I always had at least one hard-copy book lying around and at least 2 books ready to go on my phone, it was always convenient to read a few more pages. I would usually read for 5-10 minutes right after I woke up, and another 10-20 minutes right after the kids went to bed at night. This way, I always got at least 15-30 minutes of uninterrupted reading in every day. 3. I focused on “progress”, no matter how small it was. There were times when I literally only read 1 or 2 paragraphs at a time — not necessarily ideal, but it’s all the time I had at that moment and it was better than reading nothing at all. I also always read at least 1 page before I went to bed. Even if I was dead tired, I figured I could manage at least 1 page. 4. I used any spare time for reading. I’ve never been a big TV watcher, but over the past 2 months, I essentially cut out any and all TV and Netflix shows. I also stopped logging into Facebook as much and used any extra free time to read a few more pages. Obviously, I can’t read in every moment of my free time forever, but this little experiment did help me to realize that I actually have a bit more free time than I thought! If you think about it, these 4 tips could easily be applied to SO many different areas of our life — exercising, eating healthier, cleaning, organizing, saving, etc. If we make it convenient to exercise, eat healthier, clean up, get organized, or save more money, we will be much more likely to do these tasks than if it were very difficult, cumbersome, and inconvenient. And I’ve already talked about how crucial it is for me to “save first”, or “do it now” instead of waiting until later. Similarly, if we have the main goal of “progress” in mind, we can continue to move forward with our goals, even if that forward progress is very small. Small amounts of forward progress are always better than no progress at all! And if we use all our little bits of spare time to focus more energy on whatever our goals are, we might just realize we have a whole lot more “free time” than we originally thought! I know it’s not always as easy as simply deciding to do something and then effortlessly following through — but this little experiment definitely solidified the fact that we usually have a choice as to how we spend our time. The next time you’re tempted to bemoan the fact that you “don’t HAVE enough time for something,” I’d like to challenge you to stop and think about another activity you could temporarily give up (or scale back on) to MAKE more time. I really lived The Fringe Hours!! 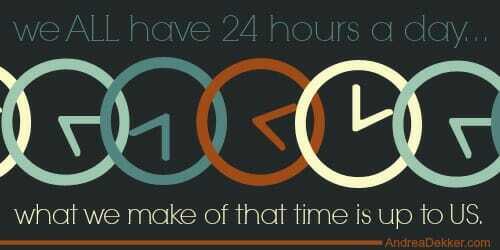 I totally get it when people say we all have 24 hours. BUT, I honestly have a lot of things I enjoy doing and I honestly feel like I do not have time to do them all like I would like. I blog, love photography, love to read, like to read blogs, knit, craft, bake pretty pies, spend time with my husband, go out for coffee with my friends, watch a good movie with my family, play games with my kids….to mention a few things!! Not counting all the have-tos! Not complaining…just saying, I really never feel like I have enough time. I probably just need to realize that things go in cycles, so if I read or craft, then one of my other projects has to wait. Was fun to read this post and hooray for your books read!!! I don’t think there would ever be enough time in a day for everything I really enjoy doing either… I could probably list 100 things if I tried! In fact, I don’t think anyone has time for everything they enjoy — but if we prioritize the things that are most important to us, there’s a decent chance we can make time for those handful of activities, people, events, etc. So one night a week you can have game and movie night with your family, 1 or 2 times a month you can have coffee dates with your friends, 1 night a week you can relax and do something fun with your husband (even just at home), you can read for 15 minutes before you go to bed each night, and also on your lunch break (if you work outside the home). You can have an afternoon of baking pies once a month and look for something to take a nice picture of each day. You might not get as much time for every activity that you’d ideally want, but I do think you can probably make the time for many of the things on your list. And I 100% agree with your comment about how things go in cycles. I have more time for different activities in different seasons of the year, on different days of the week, and as my children reach different milestones in their own lives (like sleeping through the night!) I always think about how much “extra time” I’ll have once they are all in school full time — but then they will have all sorts of after school activities and they’ll be going to bed later, so in actuality, I’ll just have productive hours during different parts of my day. As an only child, I grew up lost in the world of books. Now, at age 49, I read over 100 books per year. Sometimes MANY more than 100. My kids are older now, 4 grown and 6 still at home, but my youngest is 9. SO I have more time TO read now than I did when I had a whole bunch of toddlers and preschoolers. I loved the post though, because meal planning and cooking have ALWAYS been a struggle for me. 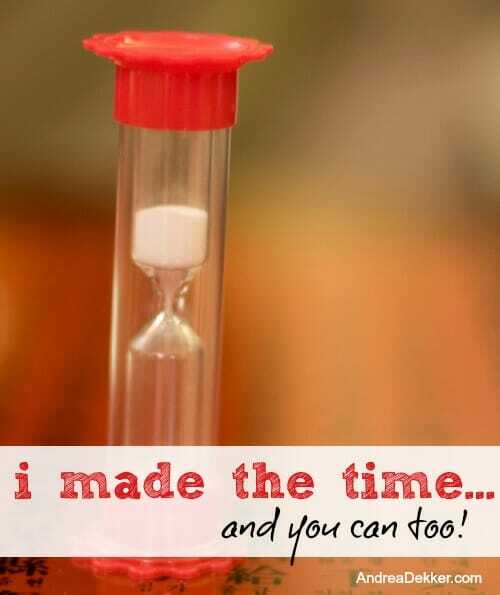 And if you could do this, well…I need to check my time usage. HAHA!! I have read 2 middle grade fiction books since yesterday morning. (Over 500 pages total). I love to read middle grade and YA fiction when I need something lighter and happier! I use Modern Mrs. Darcy’s website and podcast for book recommendations. Her podcast What Should I Read Next is such a fount of wonderful book recommendations!! Another great and completely free way to enjoy books is audiobooks available through your library. My Grand Rapids-area library has an OverDrive app that I downloaded to my phone and use to find and check out tons of books. I listen to them whenever I can — driving, walking my dog, or doing some mundane task like folding laundry. This doesn’t really have to do with making time for reading, but it does have to do with The Little House on the prairie series. We (my two girls and I) went to a program offered by our local library tonight. It was a woman that does historical first impressions. Tonight she was Laura Ingals Wilder as an older woman. She talked about her life and publishing her books. During the q & a period she told us that the book was considered Historical fiction. Meaning that it wasn’t all true. The editor’s at the time would mix up the order of things in order to make it more interesting to sell books. The woman was exceptional at the portrayal. She did extensive research talking and corresponding with descendants etc. Hope I didn’t disappoint you. When she mentioned this a few people were very disappointed to hear this because they thought that the books were accurate. I too have a weird thing with the little house series. We have read them twice and listened to the series on disc once. They kids were all captivated by them. From what I read, the editors also purposefully left out some parts (like about drunk people and murders) because they didn’t want kids reading about that. I guess I can understand that though! Your comment about having a weird obsession with the Little House books and the author made me smile. Over the period of years I was home schooling my kids I probably read them through 3 or 4 times. I read a lot of books to them, but these were probably my favorites. Reading aloud to my kids was my absolute favorite part of home schooling. Now they are all grown, but I will sometimes make a reference to some aspect of these books to which they all do an eye roll. Thanks for sharing these book titles–I am always glad to get a recommendation. I always have a book I am listening to in my car–it’s a good time to get some “reading” in! I really needed to read this! I feel the same about reading, not an avid reader but occasionally enjoy it. I have to use every bit of my down time to pick up a book that I have but haven’t started. I also need to use 5 to 10 minutes on something I used to enjoy for hours and now say to myself I don’t have the time anymore. One question though, how do you stop yourself from thinking that reading is another TO DO item to add to your list? I want to read or do whatever for the enjoyment, just like watching a Netflix show. It seems there’s enough TO DO items that keeps us feeling pressured to get done and that’s why many, myself included, just want to relax by doing nothing for a few hours. Well honestly, I think it HELPS me to think of reading as another ‘to-do’ but more of a “fun” to-do. I don’t let myself feel pressured to read, but I do enjoy doing it for 5-10 minutes and then crossing it off my list! I loved reading this post. I have a similar story, in that I didn’t read many books until about 5 years ago – which is surprising, given that my girls are 3 and 6! My husband and I both moved to a small town (population 1400), far from either of our home towns, and far from our family. The library happened to be the place where I started visiting frequently (since it’s one of the few public meeting areas in town), attending a childrens story hour on my day off with my oldest child, and meeting the people who I now consider my close friends here. I never thought I’d join a mom’s book club, but that’s what I did – in order to meet people and make friends. It started me down the habit to reading more and more. 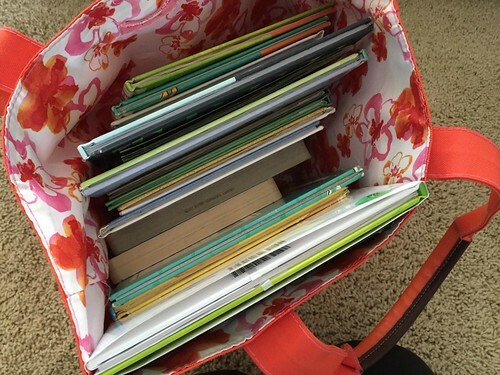 I do a lot of what you mentioned – read in every little spare moment, carry a book in your bag/purse, read before bedtime, etc. (By the way, Gretchen Rubin has a good book to read on habits, and also one you might enjoy called “The Happiness Project”.) I work with some people who have said “how do you have time to read so much?” as I watch them spend their entire lunch break surfing facebook (which I also do occasionally, but like you said – it’s all how you choose to spend your time). 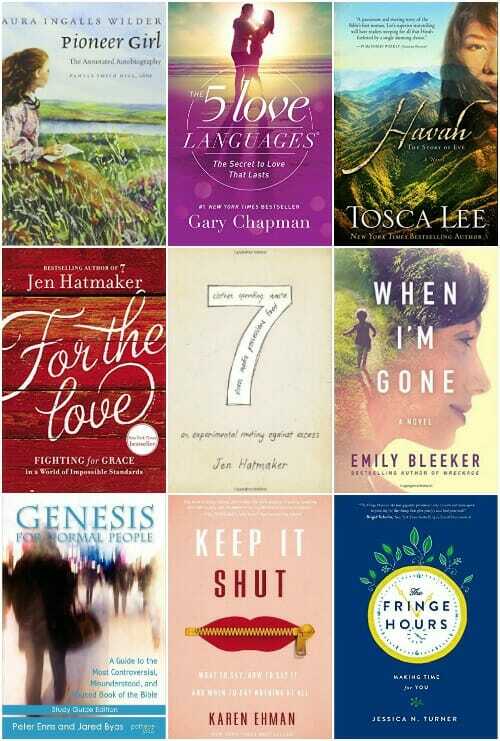 I also read The Fringe Hours, and am curious to read The 5 Love Languages. Has that book helped you be more understanding of those who gift a lot for their love language? Thanks for all these tips and ideas Rhonda! As for the love languages book — it’s mainly geared towards marriage relationships. But at the same time, I found myself thinking of so many of my other family member’s love languages (some of which I know are “gifts”). I guess it probably can’t hurt — and the ebook is free! In regards to what I WANT to make time for, the things I KNOW I enjoy doing, I like to make time for holiday crafts, puzzles, karate class, cooking and baking. I signed up to get daily emails from the website Inspired Reads ( inspiredreads.com ). They are marked down and some free kindle ebooks — mostly fiction, some true or historical fiction, some educational or inspirational. I have a free kindle app on my iPad. The books are Christian based, so I don’t need to be concerned with vulgar language, situations, etc. I desperately WANT to be journalling regularly for my girls, just recording sweet memories, etc., yet I seldom make the time for it, although I seem to have plenty of time to waste on Facebook. If I don’t actually make it a priority, do I really want it that bad?!?!?? haha — we all have plenty of time to waste on Facebook! One idea, I know there are companies that take your facebook posts and turn them into cute little photo books — you could use your time on facebook to “journal” about your girls by posting cute little things they do, and then turn those posts into photo books later. Not sure if this would work or not, but it came to mind when you mentioned facebook! As a person who enjoys reading for pleasure, this made me happy to see :). There are a couple things I’ve found to be helpful in keeping me reading, especially as I’ve become a mom. I use Goodreads – it’s a website that has information (plot summary, reader reviews, etc.) about books and if you set up an account, you can track what you read (I also do the ‘yearly reading challenge’ as it keeps me on track – works for my personality). It’ll give you recommendations based on what you read. I particularly like marking books as “want to read” as I see them on the site. Then whenever I’m needing more books, I’ll have goodreads open in one tab, and the library website open in another tab. I’ll use my goodreads list to remind me what I’m interested in, order them from the library, and that way I (almost) always have books available for me to read. I also use our library’s online media to borrow kindle/e-books – I’ve found this to be great while rocking my toddler. I find I spend less time browsing the internet/social media and reading more, which in then end is more enjoyable to me. I read this after my comment above, but I can “second” all of what Allison says about Goodreads.